"The newly built Arlanda hotel is situated on a wooded hill, which slopes to the shore, 300 m. from the beach, 5 km from Sunny Beach and 35 km from Bourgas Airport. 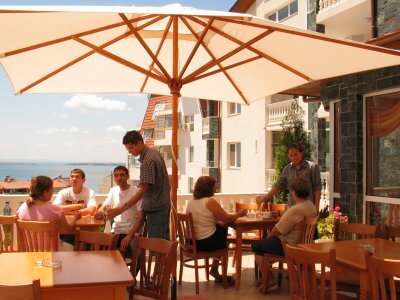 Sveti Vlas has a unique climate due to the combination of sea and mountain air, most favourable for people with asthmatic and resiratory conditions"
"The charming 4-storey hotel offers pleasant accommodation in its 13 rooms (doubles, twins, single, split-level suite). 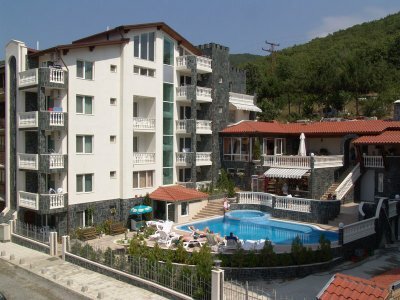 the location of the hotel is great with fab views of sunny beach, the staff, the food and the service was excellent, i will be going back for another holiday! Please add our comments to others regarding our stay at the Arlanda Hotel in Sveti Vlas, Bulgaria. We have spent five nights at the Arlanda Hotel. We found the staff very kind and friendly. 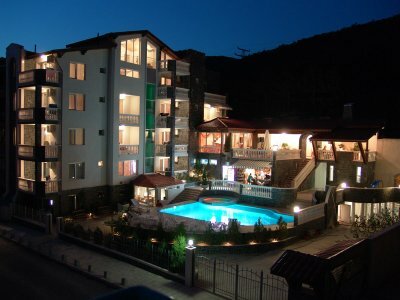 The hotel is new two years in operation so everything is very modern and clean. The swimming pool is beautiful as well as the garden. They serve the best breakfast in Europe! Something for every culture. Òhe restaurant is opened through out the day and also in the evening serving great food. We walked to the beach and for shopping in the town of St. Vlas. We give this hotel five stars!